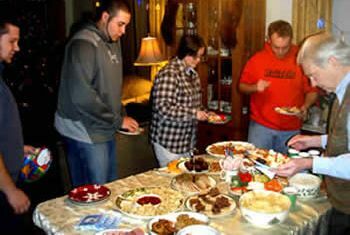 April 23, 2017 -- The physics spring picnic was held at Bob Grose's house. We all enjoyed Bob's prize-winning chili. Everyone entered a drawing for physics prizes, and everyone won a great prize. 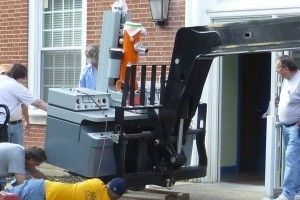 Dr. DeLaney learned to drive Bob's old tractor. Bob showed us his projects in his machine shop. 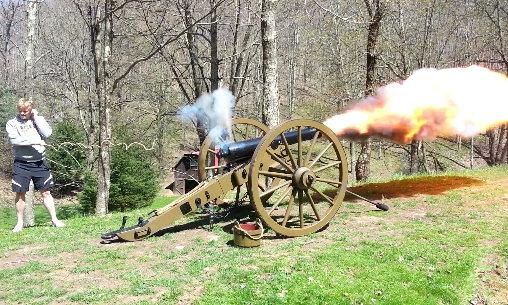 He also fired his homemade replica of a cannon from the Civil War. Plasmas.∙The∙four states of matter are solids, liquids, gases, and plasmas. A plasma state is so hot that electrons are able to escape from the atoms. If a magnetic rod is placed in the plasma, the ions will encircle the rod. 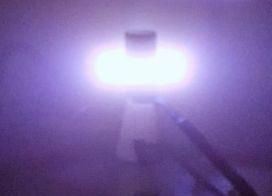 The photo shows the argon plasma apparatus that Matt Phares built. Spectroscopy∙of hydrogen. Light often consists of a mixture of different colors. A spectroscope is a device that separates such light into its component colors. 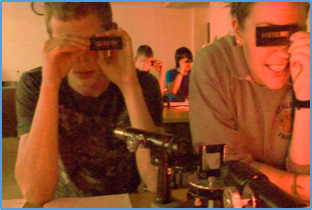 Cody O'Meara and Hope Lima are observing the hydrogen spectrum in General Physics Lab. Catapult contest. 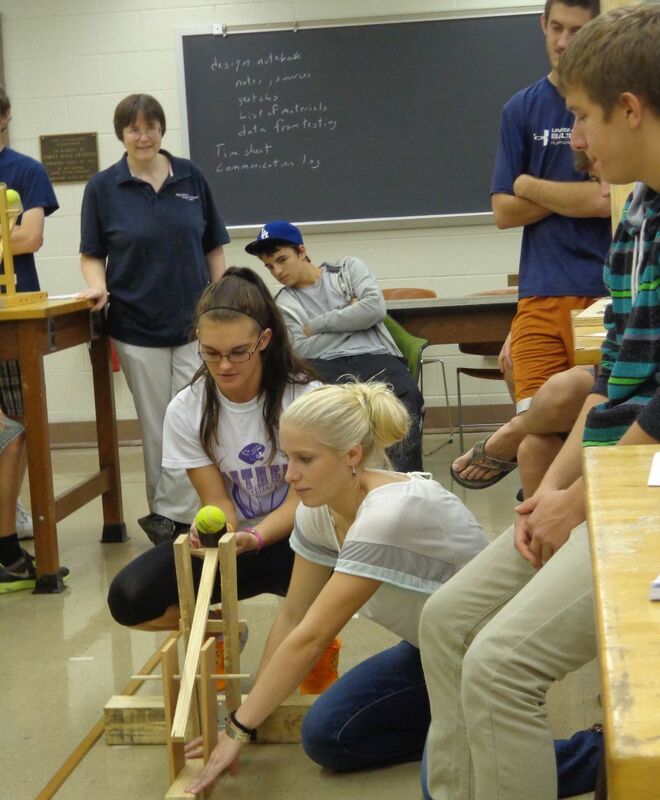 Amber Stewart and Lauren Cronise won the prize for the most accurate catapult. Their tennis ball went into the bucket for all five trials. Bridge∙design contest. 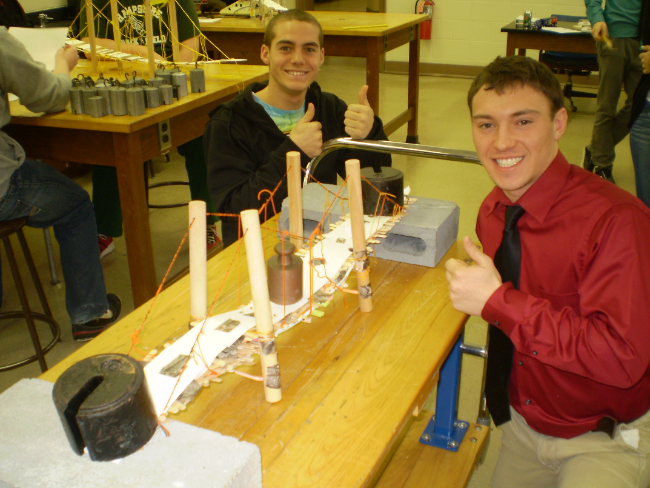 Alex White and Justin Smith were awarded first place for their suspension bridge design. Field∙trip∙to∙Pratt and Whitney in Bridgeport. 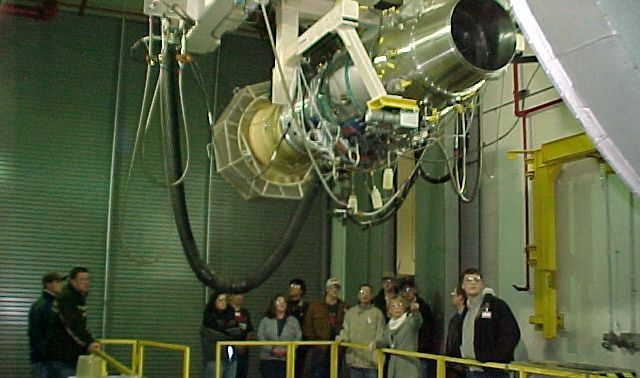 Students are in the room where jet engines are tested while running. 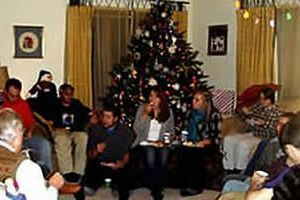 The room is too noisy for anyone to be in the room while the testing is conducted. Feast.∙We∙are enjoying homemade cookies, chips, veggies, fruit salad, and punch. Laser∙show.∙Everyone's gathering around the Christmas tree. Soon there will be a laser show. 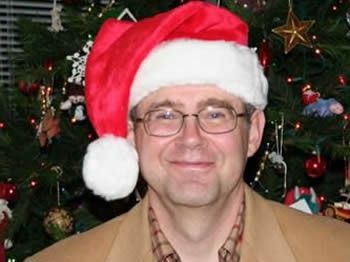 And there will the best presents — a slide rule, vacuum tube, Dr. Popson's last marble, a pair of four-sided dice. October∙11,∙2014—Dr. DeLaney and Paige Rutter are registering visitors from the Buckhannon community. 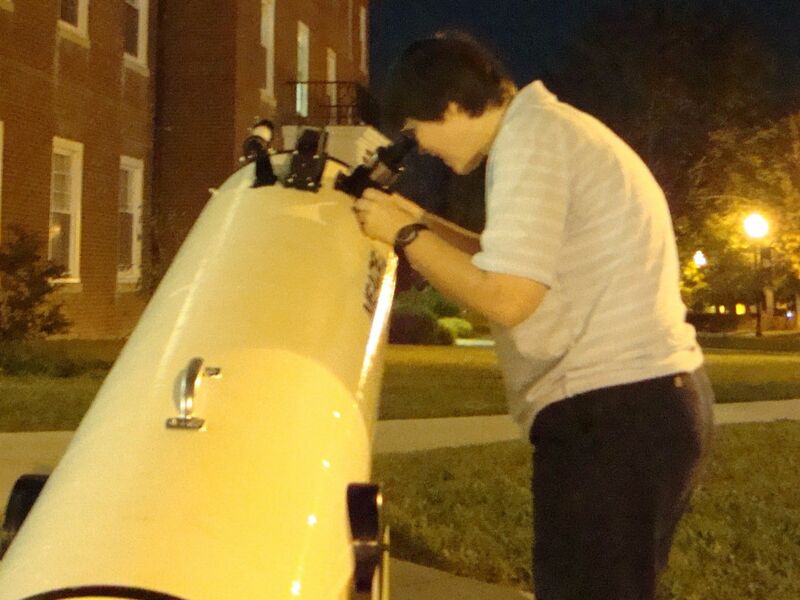 The event was organized by Wesleyan's SPACE Club with support from the NASA-WV Space Grant Consortium. Poster_presentations. Students from all around West Virginia displayed posters of their NASA projects. Representatives from the NASA-WV Space Grant Consortium awarded prizes for the best three projects. Planetarium.∙In the morning, Dr. DeLaney gave a planetarium show. 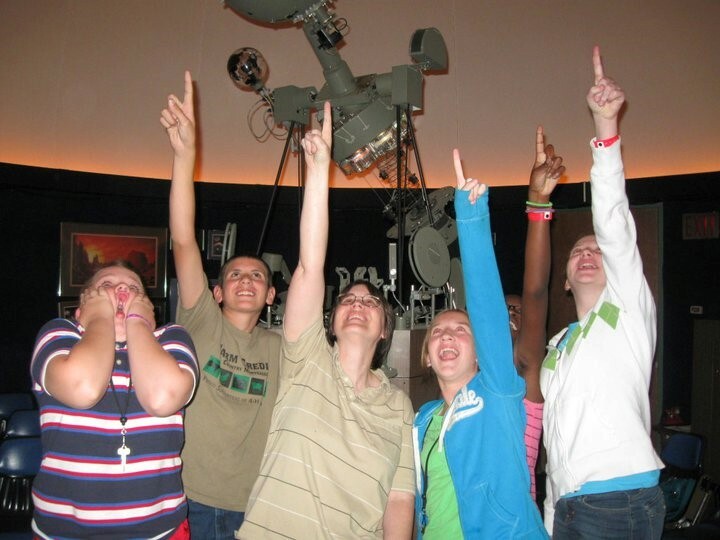 We also have regularly scheduled planetarium shows at 8:00 on the first and third Saturday of each month. The∙bottle∙rocket competition occurred in the afternoon. Competitors used card stock and duct tape to build nose cones and fins. Students competed to achieve the greatest flight time and the maximum distance. Dr.∙DeLaney∙demonstrates how a glass lens bends parallel rays of light. The location where they converge is called the focus. A∙real∙image. Students use a converging lens to focus an image on the screen. You can identify a converging lens because it's thicker in the middle. SPACE∙Club∙balloon launch. On March 7, 2014, students sponsored a tethered helium-filled balloon launch. They flew a payload consisting of magnetic-field sensors, an accelerometer, and a Geiger counter. Dr. Steven Hard came from NASA IV&V to supervise. 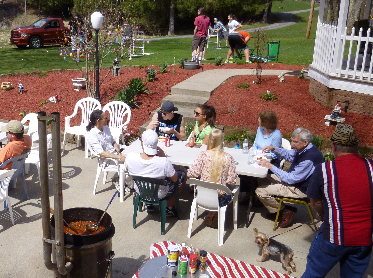 April∙17,∙2015—The Physics spring picnic took place on a perfect day at Bob Grose's house, which is located at the end of a long country road. Bob made the world's best chili. 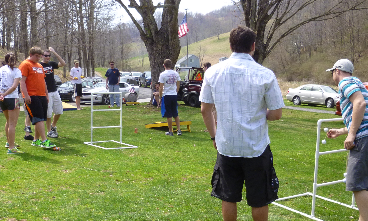 Afterwards,∙we played lawn games. Dr. DeLaney gave away some great door prizes. Then∙Bob∙took∙us up the hill to his workshop. He showed us the antique car that he is rebuilding. He also let us fire his homemade cannon.